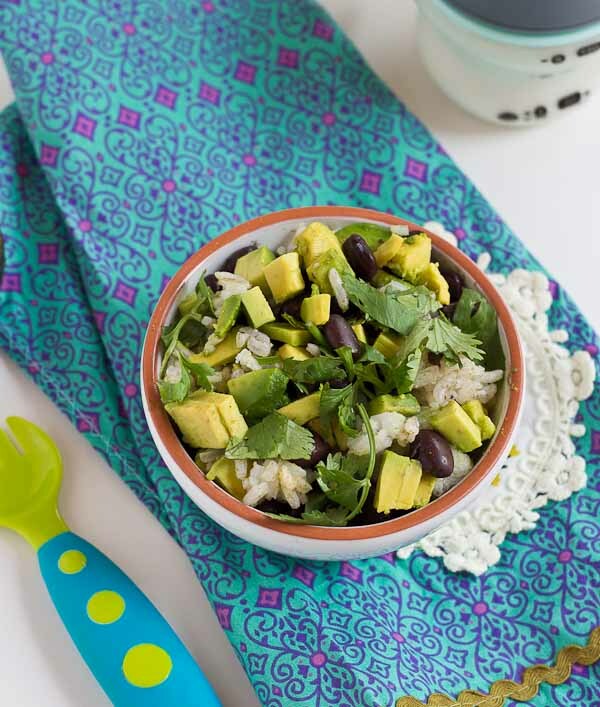 These Vegetarian Baby Burrito Bowls are a meal the whole family can enjoy and a great way for baby to develop their pincer grasp! 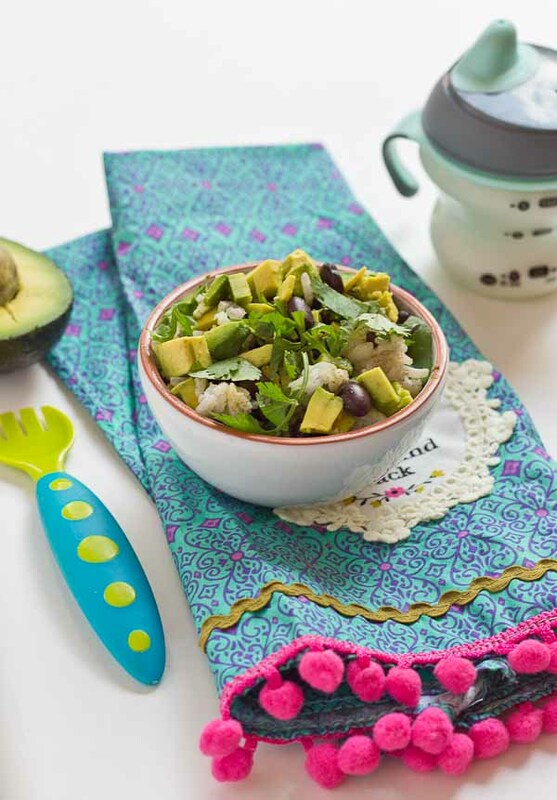 Beans, avocado, and brown rice are wholesome foods for baby and you! If your baby isn’t ready for finger foods, simply puree this meal to the desired texture and consistency. Here’s the DL on my current mom problem. My baby is nearly 9 months old and only wants to slurp foods– read: milk from the mama source, smoothies, and squeezes. He refuses the spoon and easily gags on soft nibbles of finger foods that “should” be developmentally appropriate. Yes, we even gag and spit up on quickly dissolvable puffed cereals that are broken in half. 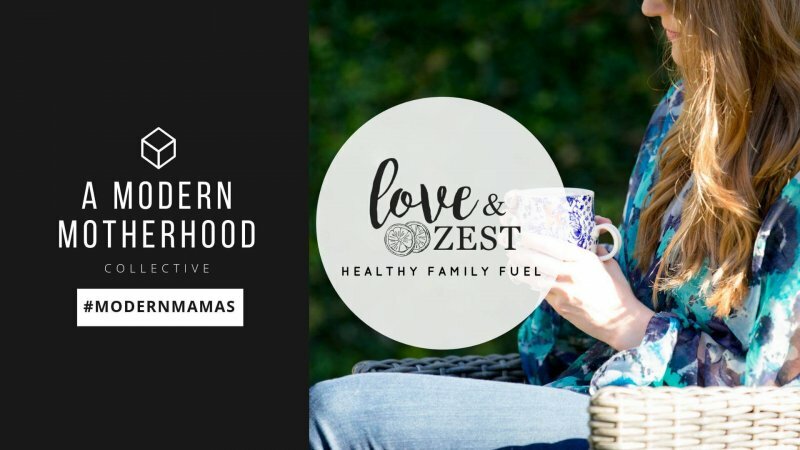 This would happen to the RD mom that wants her child to eat a wide variety of nutritious foods with different textures, but it’s just not happening like the baby books suggest. But why am I fooling myself?? Parker hasn’t ever followed baby book progressions, to my type-A personality’s demise. 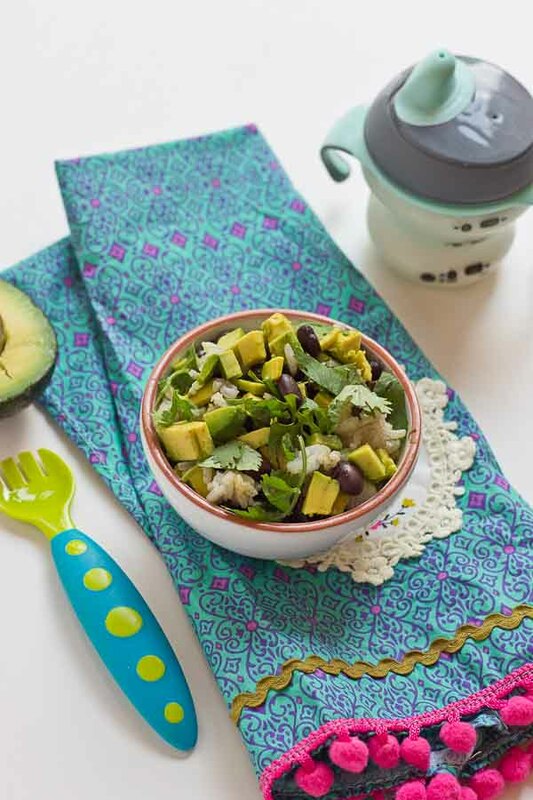 When Dr. Sonali Ruder of The Foodie Physician reached out for me to feature a recipe from her new cookbook, Natural Baby Food, I was pumped to read what she had to say about feeding wholesome nutritions foods from babies to toddlers. There are over 150 recipes in this book! 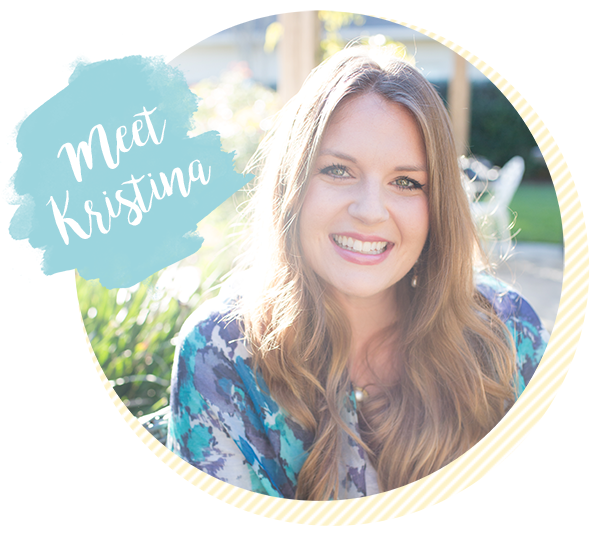 I’m a big fan of her book– especially when I read her advice on, “What solids should I introduce first?” This simple question receives so many opinions, and to be honest it boils my blood when mom’s hear the same watered down advice from their pediatrician– start with baby cereals, then fruits, then veggies then meat. So many moms take that old advice and start their baby on processed grain cereals that aren’t even whole grains! When in reality, it doesn’t matter what the heck you start off with as long as it’s soft and the right consistency for baby to eat safely. (Of course there are still foods to avoid, like honey and milk and maybe certain allergens, just to name a few). Dr. Ruder shares my opinion on this topic too and I love that she supports the latest evidence in feeding. In fact the American Academy of Pediatrics now states that “there’s no medical evidence that introducing solid foods in any particular order has any advantage for your baby.” According to Dr. Ruder, “you may just as well start with a vegetable or fruit puree and meats can be introduced at an early age.” The current recommendations are that meats, such as turkey, chicken and beef should be one of the first solids added to the breastfed infant’s diet because breast milk is typically low in iron and zinc, two nutrients crucial for the developing baby! “Beans and legumes like chickpeas and lentils are great vegetarian sources of protein and are also high in iron.” I love to add beans to a “smoothie” for Parker, or we opt for the bean based veggie squeezes. 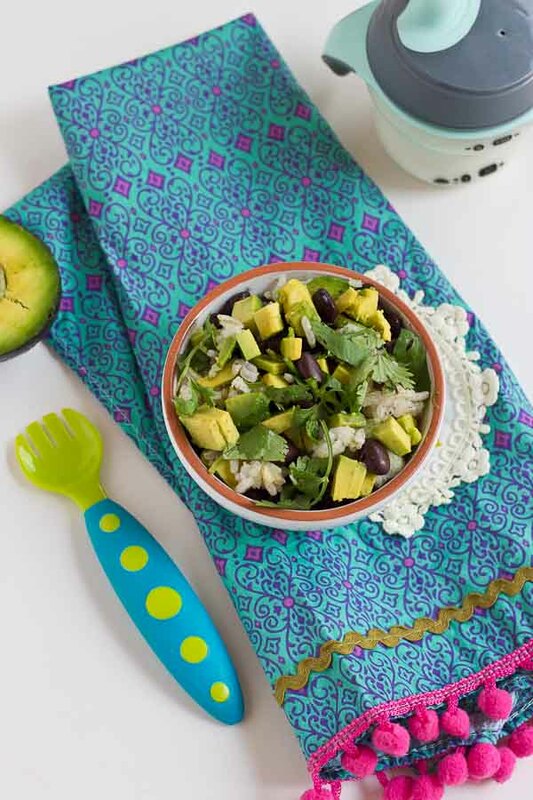 So my adapted strategy with feeding Parker is to continue to give him foods in drinkable form and also provide foods like this Vegetarian Baby Burrito Bowl at the same meal that he can pick up with his fingers and explore…. and I will try to breathe and pray that he learns to chew food fully before he swallows. 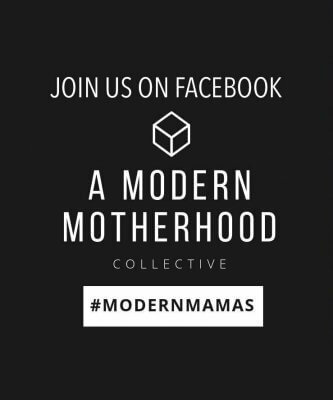 Why does this mom thing have to be so challenging? 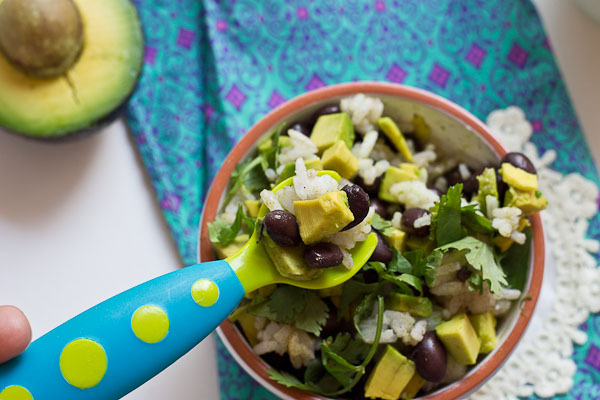 Mix the rice, beans, corn, cilantro, and cumin together in a bowl. Gently stir in the pieces of avocado. Top with cheese if desired. Let your baby enjoy picking up the food with their fingers and feeding themselves. If your baby is not ready for finger foods, transfer the mixture to a food processor or blender and puree with a little water or low-sodium chicken or vegetable stock to desired consistency. Great recipe. Great information for people out there. Food is future. You are welcome!! I’m glad you’re working to make real baby food the norm. SO much confusing information out there on feeding little ones.